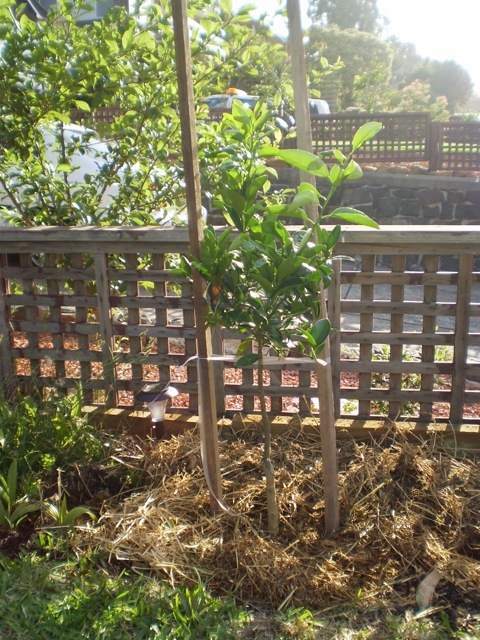 On Sunday I drove up to the Wollongong Wholesale Nursery at Albion Park Rail to buy some fruit trees with my Sustainable Illawarra Super Challenge vouchers. 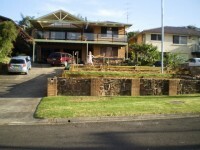 The staff there were really helpful, and gave me some good ideas for the types of trees that would suit our needs for the front yard. I pretty much already knew what I wanted for the main planting areas, but we had three large planters Megan bought at the Magnet Mart closing down sale. 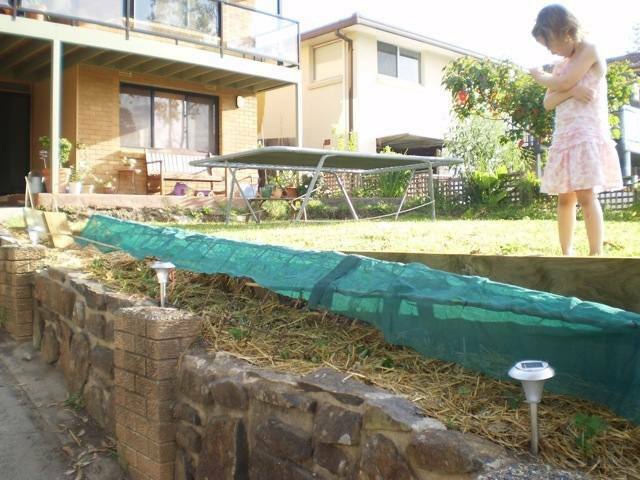 We wanted to use them to screen our view of the neighbours’ yard, but still grow something edible and useful. 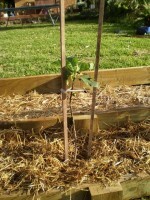 With some excellent advice from the nurseryman, I decided on a couple of feijoas, with a lime tree in between them. I’ll post some photos when I get them planted out. 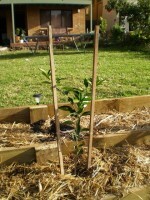 For the front yard I bought a mandarin and an orange. I already had a white mulberry from a friend’s garden, another citrus of unknown type (I suspect either mandarin or cumquat – it was unlabelled, for $5 at Magnet Mart), a fig, and an avocado. Yesterday we finally got around to planting them out. 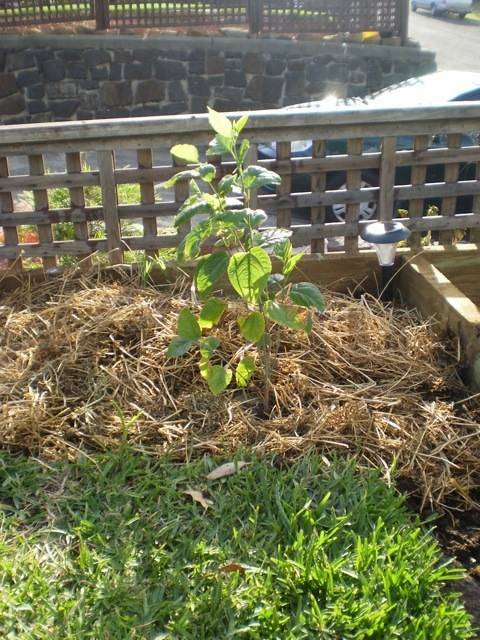 The new garden beds had been filled with mushroom compost, manure, stable sweepings, and topped with a straw mulch for a couple of weeks. They were already full of worms and were breaking down nicely. The trees should be happy there. 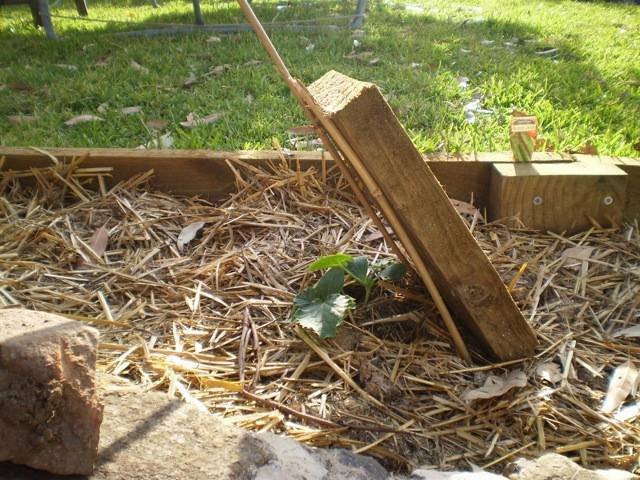 I also bought some zucchini plants (one black and one yellow) and some more strawberries to add to the ones we had already transplanted from the strawberry patch out the back. Both of these needed some protection from the hot, direct sun, so I rigged up some temporary shade. Good luck with the feijoas, they are my very favourite fruit. I have two with a few fruit on now but Sydney is really a little bit warm for them I think. 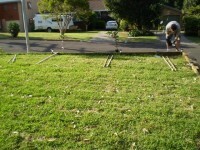 Your yard is shaping up great. 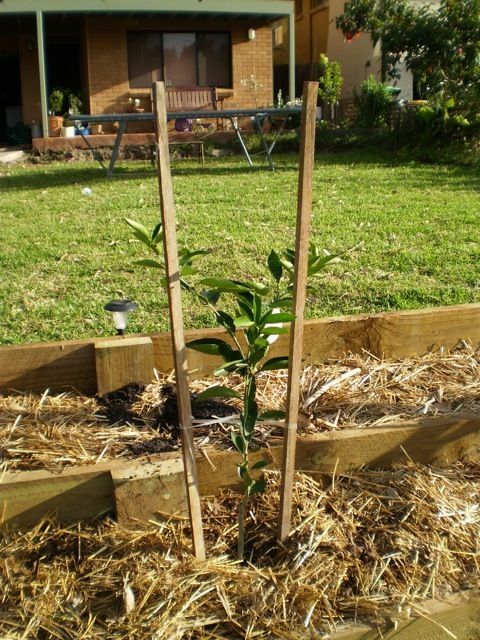 My hubby has just gotten on the fruit tree kick and has recently planted an avocado and mandarin tree (in addition to the lemon and orange that we already have). He’ll be mighty jealous of your space for trees. 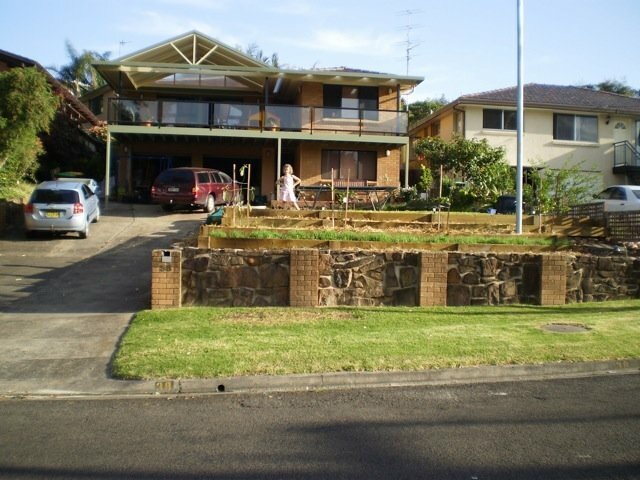 We’re on a battleaxe block with a pool in the backyard so not a lot of spare land. @Greenfumb: I haven’t actually tried feijoas before, but they sound delicious. 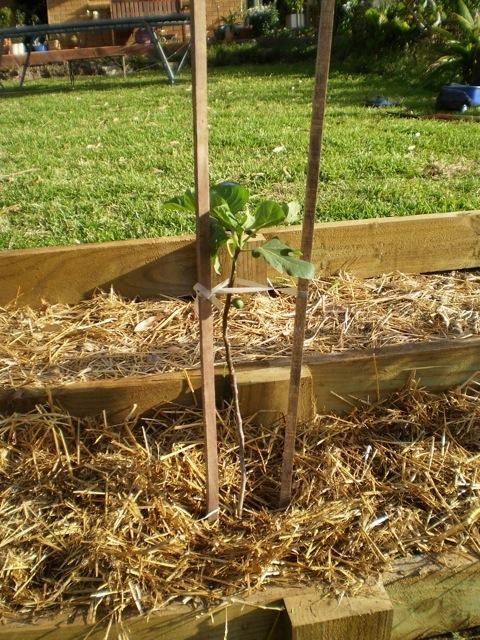 The advice I got was that feijoas would grow well in this area (just south of Sydney), so hopefully they’ll be OK. Time will tell. @Libby: Thanks! 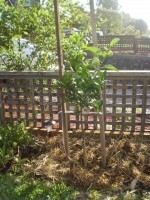 We didn’t originally have a lot of space for fruit trees either, but I’m sneaking them in around the edges of our block. 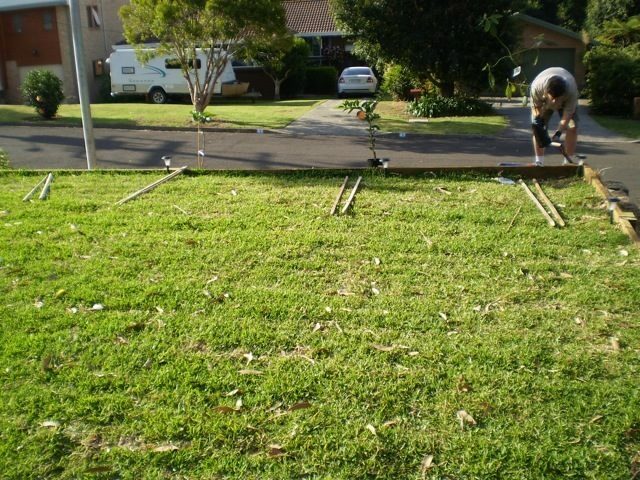 We really want to keep a nice grassy playing area for the kids, though, so compromises are being made :-). 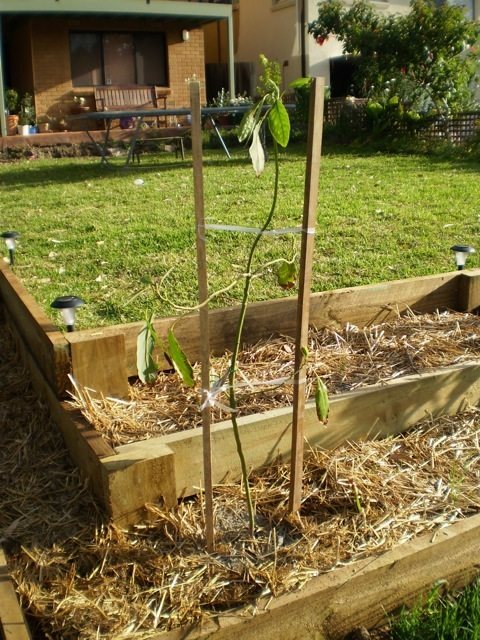 I think once the kids get a bit older, I’ll turn the whole front yard into a massive vegie patch! 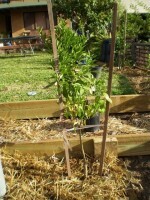 I’m also planning to put some apples along our southern fence, and espalier them along it. Should be interesting. What a difference with your front year. The big trees are gone now eh? 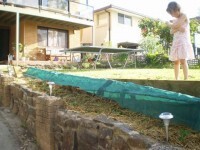 That should give you heaps space to plant things. Yeah, we just had the one small tree actually in our yard. All the big ones were in the neighbour’s yard. Now that they’re gone, we get heaps of sunshine (and so need some shade back!). Terracing the front bit has given us a lot of space to play with too. Great to hear from you, by the way! 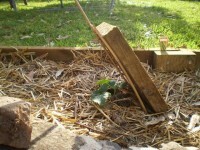 Check out some of the photos of my garden progress which I have posted to Facebook. The public link is: http://www.facebook.com/album.php?aid=76047&id=576476734&l=6dcc6 The transition is certainly occurring. Soon we will have more sweet potato than we will know what to do with. OK that is not entirely true as I am part of a local food group in Samford, so I would just sell or trade them for other produce. Cool! I’ll look at the photos tonight. 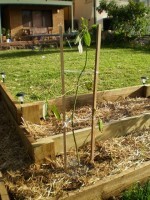 I’m planting some sweet potato out the front, as well as the potatoes that are there now. Plus Jerusalem artichokes as well. There is a local food group in Jamberoo that’s starting to get off the ground, which is really good. I’m not sure I’ll be able to grow enough to trade much though! Maybe I’ll have fruit once the trees get going. There are a number of people in our group who do not trade food, they simply buy it. I would highly recommend attending a session or two in order to check it out. Our group has got a wealth of knowledge. It is great to share ideas and hear ideas from people in the group. Say, is it possible for your website to send out an email when a comment has been made to a posting one has commented on? Your group sounds great. I’ll have a look for a plugin that alerts you to replies to comments. That’s a good idea to keep the conversation going. Thanks! For anyone following along at home, I just added the “Subscribe to Comments” plugin. You should now see a little tick-box below the comment box. Ticking it will email you whenever someone leaves a new comment on the post.